Infographic proves that Metropolis' devastation is worse than New York's 9/11 attack. Today is the "anniversary" of the horrific 9/11 attack. But did you know that the destruction of Metropolis in Man of Steel was a gazillion times worse than 9/11? 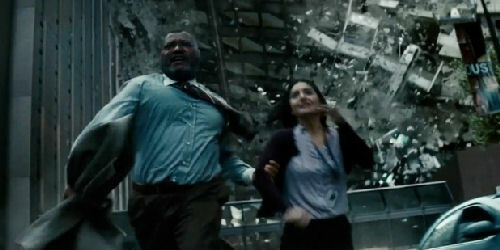 On Tuesday, September 11, 2001 the terrorist group al-Qaeda launched a series of four coordinated plane attacks on the United States in New York City and Washington, D.C.
At the end of the 2013 film, Man of Steel, Superman (Henry Cavill) and General Zod (Michael Shannon) fight through Smallville and Metropolis. Buildings fall and people go flying through the air. Writer David Goyer acknowledged the massive scale of the damage and said, "One of the things we were hoping to depict is that Superman is not a god. We say he’s a god-like figure but he’s not omnipotent. Even in the comic books he cannot save everyone. I think people die [in Metropolis]. Clearly hundreds if not thousands of people have died while the gravity machines are going off. There were probably even people who died in Smallville. "When you’re dealing with a threat like this, there will be collateral damage. This is something that hadn’t been depicted in comic book films is what it would be like if these powerful figures did clash, if The Hulk and Thor fought, people would probably die. Particularly in this case where Zod and the Kryptonians really don’t care if people die. I think people died and I’m sure that upsets some people." But, exactly how much damage was done? In a study done for BuzzFeed, scientist and longtime disaster expert Charles Watson and his team at Watson Technical Consulting modeled and anticipated the damage done to Metropolis. 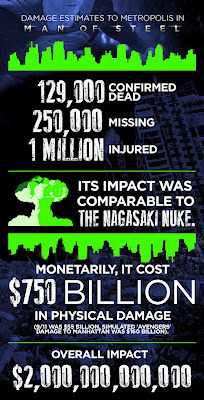 They calculated both the human casualties and monetary cost. They ran analyses of the World Engine ground zero in Central Manhattan and central Chicago. Buzzfeed says, "WTC estimates that, in the days after the attack, the known damage would already be stunning: 129,000 known killed, over 250,000 missing (most of whom would have also died), and nearly a million injured." In terms of the strictly physical damage done to the city, the initial estimate is $700 billion. 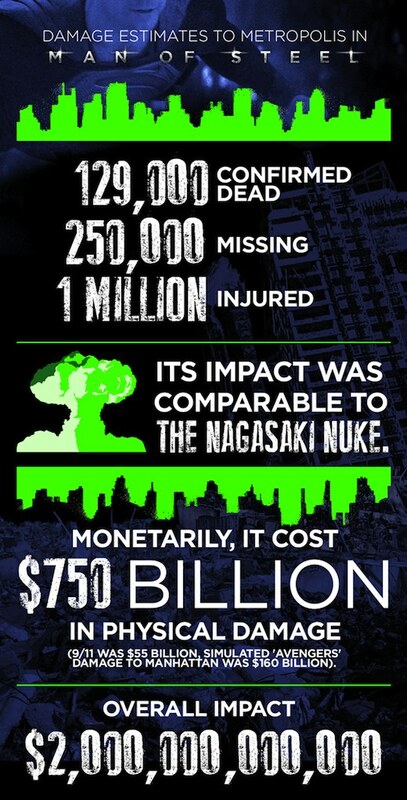 Compare that to 9/11’s physical damage which cost $55 billion, but the further economic impact was $123 billion. Here's an excerpt from the report be found at WTC’s site. Disasters can bring out the best in human nature, but also uncover the worst. The financial toll is equally enormous, and it is here the darker side is unfortunately revealed. The dust from collapsing buildings had not settled before LexCorp’s infamous Kinetic Assessment Cartel (KAC) were spreading across the city, calculators in hand, tallying the damage and, no doubt, getting a jump on their potential competitors for lucrative post-apocalypse recovery contracts. KAC’s initial estimate of over $750 Billion in direct physical damage is truly astronomical, and probably correct, but not as astronomical as the profits these vultures hope to reap from the city’s misfortune. Of course the city must be rebuilt, but we must say we are disappointed in Mayor Berkowitz for giving LexCorp a sole source contract for this vital task. We suspect the Mayor will regret this contract at some point. With billions more in cleanup, economic impact, and other the total will easily be in the trillions of dollars. What do you think? Was the destruction in Metropolis worse than 9/11 (in a fictional context of course)? Yipes. Way to drop the ball there, "Super"man. Did they study "The Avengers" too to see how that stacks up in comparison? And how much damage does Godzilla do every time he sacks Tokyo? Those people must get sick of rebuilding the place just for him and his Monster Island buddies to trash it again. So thats why Batman is so mad. He doesn't want him near Gotham. Shame about the vultures. Always where there is money to be made. I can't believe they didn't show any of the destruction when Clark went ot work at the Daily Planet at the end. I don't think there was a building left untouched by the end of that fight. Was there? Oh gosh, when I finally see the movie, I'll try not to think about the astounding level of collateral damage. Most boring battle of all time? So many punches so little excitement.